Dubai Duty Free has changed profoundly in scale and sophistication from the fledgling start-up that commenced trading on 20 December 35 years ago. But one aspect of its business has remained constant – its leadership. Colm McLoughlin has been at the helm since the first day’s trading and three and a half decades on he insists that he’s as passionate about the business as ever. Certainly, his golden touch remains undiminished as sometime between the 35th anniversary on 20 December and New Year’s Eve, the business will break through the US$2 billion sales barrier. Not bad for an enterprise that, in McLoughlin’s words, “Buys things, adds something on and sells them.” Martin Moodie reports. Colm McLoughlin: Leader, legend, industry statesman. And still the vision stays alive. While I wait on the telephone line to be put through to Dubai Duty Free Executive Vice Chairman & CEO Colm McLoughlin, a holding tune plays down the line. It’s not just any old tune. It’s a song, in fact, co-written by McLoughlin to celebrate the retailer’s 25th anniversary ten years ago. It’s called Fly Buy Dubai, a catchy wee ditty that can be heard over the tannoy at Dubai Duty Free stores and even from giveaway gimmick pens that the retail veteran takes great delight in demonstrating. As the Irishman from Ballinasloe, County Galway comes onto the line, I mention what I have just been listening to. “Can you imagine that ‘Fly Buy Dubai’ is ten years old now?” he asks with unmasked glee. I can, I reply, as he has played it to me so many times during the ensuing decade. The anecdote’s other revelatory aspect is the self-deprecation. “We messed about a bit more and ended up with the finished product” sounds remarkably similar to McLoughlin’s now famous explanation (quoted at the original Trinity Forum in 2003) of Dubai Duty Free’s astonishing success. “All we do is buy things, add something on and sell them,” he told wide-eyed delegates, a mantra he repeated when attending the same event 15 years on in Shanghai this October. “Our philosophy is to keep it simple,” he says.” Dubai Duty Free has, in fact, been keeping it simple for 35 years come 20 December but that adherence to basics has translated into one of the retail world’s most impressive and enduring success stories. It’s one that will be triumphantly underscored later this month as sales burst through the US$2 billion mark for the first time. Colm McLoughlin has won wide recognition outside the duty free industry. 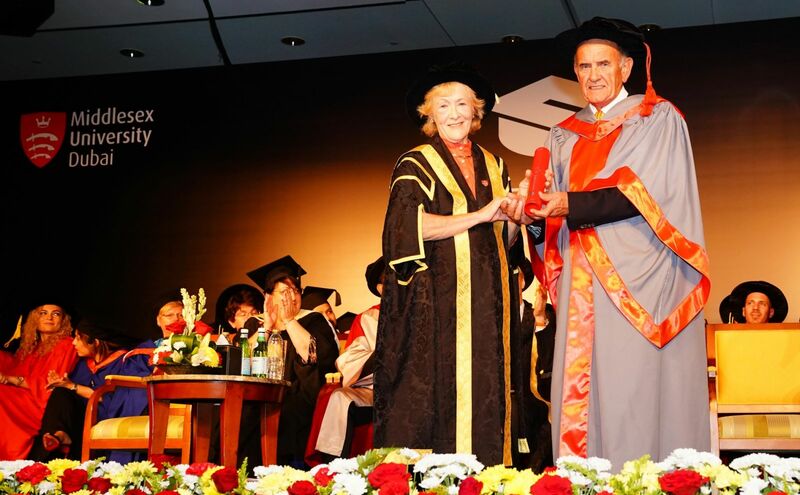 In 2017 he received an Honorary Doctorate of the University from Middlesex University Dubai for his contribution to UAE society and outstanding service to the aviation sector. In those 35 years McLoughlin has become the most recognised, most feted and most awarded figure in the global travel retail sector. But he’s never, as they say, forgotten where he’s come from – literally in the case of his Irish roots and more broadly in the sense of what a humble start-up Dubai Duty Free was. The tale of how the Dubai government commissioned a consultancy team from Irish state-owned airports company Aer Rianta for a six-month contract to set up Dubai Duty Free in 1983 has been told many times. McLoughlin was, of course, part of that team, and famously made the fateful decision to stay on after the contract’s expiry and lead the fledgling operation. He’s never forgotten the roll-up-your-sleeves mentality that enabled his management and staff to cope with those challenging early conditions. I ask him for a single abiding memory from that first year. “Can I give you two?” he replies. There he is again, adding something on. “On the day before we opened, I will always remember being in a tunnel under the airport, standing on an empty oil barrel, giving a training programme to some Filipino staff who were going to be starting the next day. I was showing them, for example, what a US Dollar looked like, showing them what a Pound Sterling looked like, and wishing them well for tomorrow. Colm McLoughlin is interviewed by Dubai broadcasting personality Phil Blizzard on the retailer's 35th Anniversary. 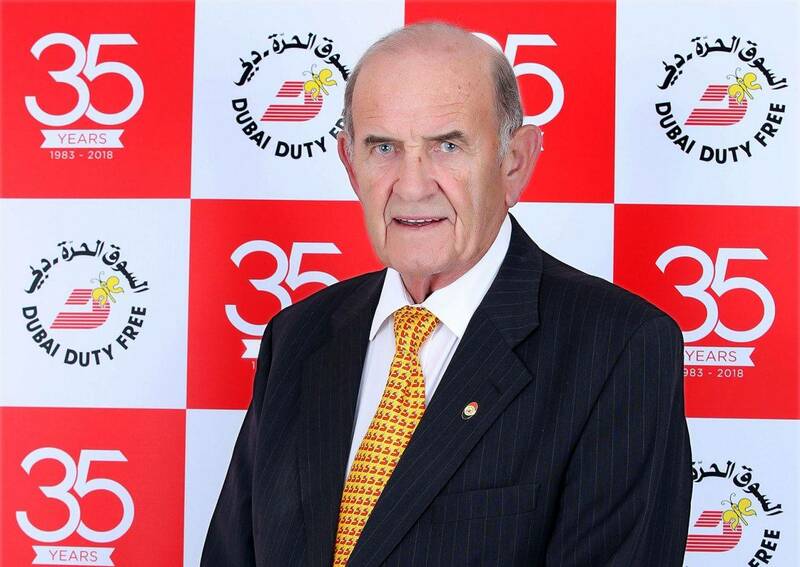 McLoughlin recalls how in the early days of Dubai Duty Free several travel retail executives had no idea where Dubai was, let alone that it was home to a thriving duty free retailer. That ignorance all changed one famous night in Nice, France in 1985 when the retailer won its first Frontier Award during the annual Tax Free show (before the event's subsequent move to Cannes). 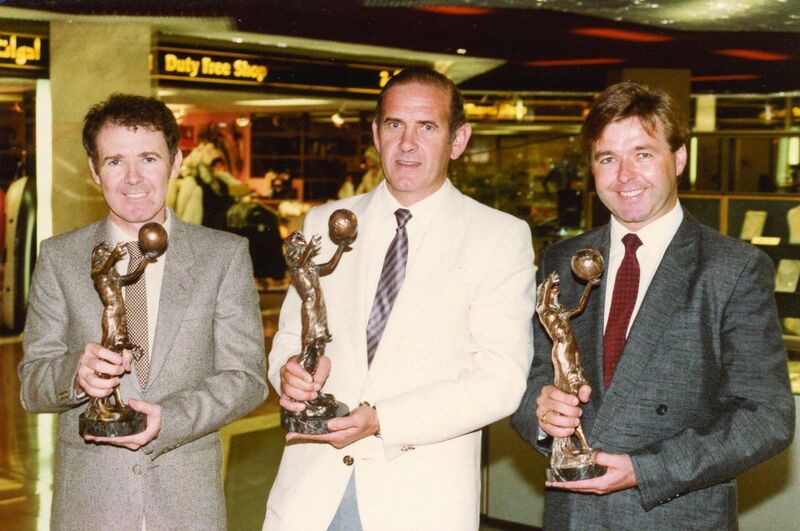 The original travel retail Trinity: (Left to right) A flashback to 1985 as Dubai Duty Free senior executives George Horan (recently retired after 33 years' service), Colm McLoughlin and John Sutcliffe (still active in the business as a board member of Aer Rianta International-Middle East) celebrate the original Frontier Award, at the time a huge breakthrough for Dubai Duty Free. McLoughlin has an uncanny memory for numbers and events, and reels off one achievement after another over the retailer’s 35 years. “Winning all the awards we have won has been an incredible thing; our continuous growth along the years has been an incredible thing. We have had only one year in our history [1990, the year of the first Gulf War] when we did not beat the year before.” Another memorable occasion came in 2002 when the retailer crossed one billion Dirhams in sale for the first time [this year that figure is set to reach around 7.5 billion Dirhams]. 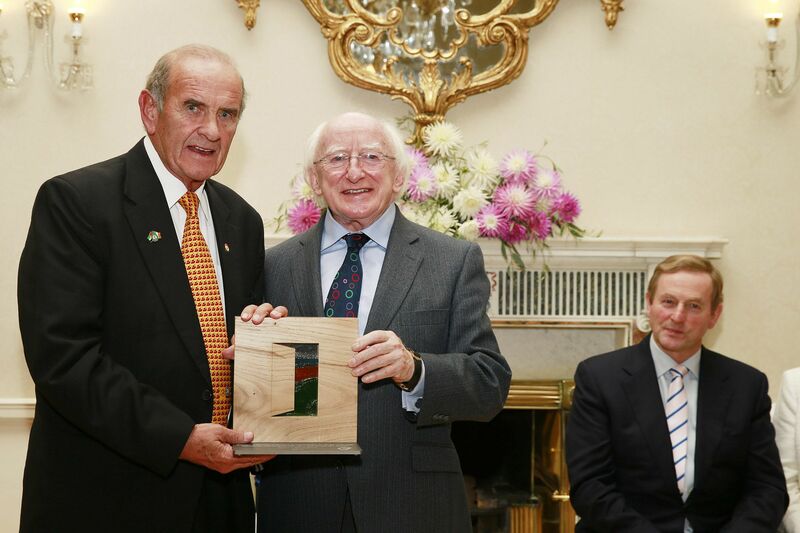 Pride of a nation: Colm McLoughlin receiving the Irish Presidential Distinguished Service Award in 2014 from Ireland’s President Michael D. Higgins, with Taoiseach (Prime Minister) Enda Kenny looking on. Staff matter to McLoughlin. So does loyalty – in both directions. His insistence on a strict internal promotional policy has meant that no senior executive has been employed from outside the company in 18 years. That philosophy, McLoughlin believes, has helped drive a sustained annual staff turnover rate of less than 6%, “which in most companies and certainly in this part of the world is unique”. Giving back to society is another bedrock. “Part of our essence that we have proven over and over again is to respect people and to give back a little bit,” he says. The understatement once more is profound. Dubai Duty Free has given many hundreds of millions of dollars down the years, often to and through the Dubai Duty Free Foundation, a charitable entity created in 2004 that benefits from the whole-hearted support of McLoughlin’s boss, H.H. Sheikh Ahmed bin Saeed Al Maktoum, President of Dubai Civil Aviation Authority and Chairman of Dubai Duty Free. Much of the corporate philosophy stems, of course, from McLoughlin’s own management beliefs. What then has been his mindset as he has begun each and every day over the past 35 years? "Travel retail's most famous son and industry statesman [like] another Shannon Airport pioneer, Dr Brendan O'Regan." This moving tribute to the life and times of Colm McLoughlin was produced by The Moodie Davitt Report to mark his 70th birthday in 2013. And how would he like to see Dubai Duty Free evolve in the very different world of post-2018 from that of 1983? “Well, of course, things have to change continuously. There’s always the question in the duty free industry about online sales taking over but that hasn't proven so to us as yet. We're going to do around US$20 million this year in our online business. I like it that things we're involved in now will continue. I want to see our Foundation flourishing. I want to see sporting activities that we're doing continue, and I want to see a continuation of our spend from our top line on marketing, promotion and sponsoring various things. 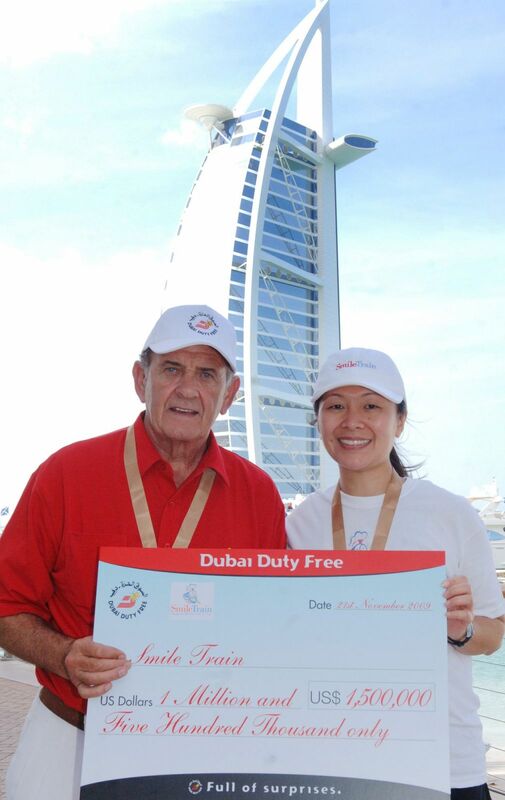 Colm McLoughlin ensured that Dubai Duty Free brought smiles to thousands of children's faces with this extraordinary donation of US$1.5 million to cleft charity The Smile Train in 2009. The longevity of things. It’s a telling phrase, reminiscent of one coined by veteran Irish professional golfer Des Smyth [who enjoys a particularly close relationship with Dubai Duty Free] who spoke during the recent Dubai Duty Free Golf World Cup of McLoughlin’s “strong loyalty streak”. Former suppliers and even fellow retailers would testify to it, often expressing admiration for being invited back to Dubai Duty Free functions year after year despite long having moved on in, or even retired from, their careers. McLoughlin turns 76 next July, remarkable career longevity by any standards but particularly in a retail sector that so often churns and burns talent and can write off people as too old even in their early 50s. Does he still look forward with the same energy to starting every day? Getting things done has been a constant now for 35 years in Colm McLoughlin’s life. And one draws the inescapable conclusion that there is an awful lot of doing that still lies ahead.